No, this isn't a doom and gloom woe is me post. Just proof that Southern California is not always sun, blue skies and palm trees. I should watch what I write on my blog and leave as comments. Its been raining pretty much the whole day, sometimes just a drizzle, and sometimes a downpour with thunder and lightning. Not quite the same view as I posted last time, but I was trying to stay dry under the overhang of the patio roof. The ocean and islands are just to the left in photo. What you're seeing is a lot of jade plant. The backyard is right up against a canyon, with nothing behind us, until you get down to the freeways below. Perfect wildfire land (and coyote heaven, there's a pack or 2 back there). When my parents first move here about 15 years ago, my dad was trimming back a jade plant and just chucked the cut branches back into the canyon. Imagine his surprise when they actually took root and started to grow. Now you're asking why would he want jade back there? Jade holds water, and doesn't really dry out, meaning it doesn't burn very well. After 15 years of cultivating jade on that back hillside, they now have a very effective "green" firebreak. The fire crew that comes out to cut the real firebreak every year or so loves it, and makes a point of keeping their ugly scar of naked earth well below where my dad has planted the jade. Plus, the jade helps with erosion, establishing a root system on the very steep hillside. At least I made the piping myself, got the pieces ready, and did the stuffing and hand-sewing shut. Nest up was Primitive Snowman by Ewe, Eye and Friends. I love the patterns these guys make, and have stitched a few of them (we won't talk about how many more I have in my chart stash that still need stitched). They're usually cute, on the small side, and have specialty stitches in them. At the time I was actually stitching on this, I wasn't really in the mood to mess around, I just wanted it done! Part of the chart got cut out (the year) and I think I forgot to go back and add in a satin stitch diamond on one spot. Oh, and confetti stitches got left off. But I hate confetti stitches, so they'd have been left off anyway. It got the rusty wire and bells treatment, since I couldn't figure out what to do as a hanger. Really I forgot to sew some ribbon in when I was at the machine - both times. Yep, the first time it got sewed up, I had my backing fabric on backwards and didn't even notice until I was turning it. That will teach me to try sewing something while I'm playing a computer game and sneaking over to the sewing machine on down time. I hope everyone is taking time to breathe during the holiday season. It can be so much fun, but in the hustle and bustle sometimes the stress can build up. Just remember, the sky won't fall if you don't get every single decoration up, or every single holiday yummy baked. Your family will still love you, and to me that's always what the season has been about, coming together and enjoying it as a family. Oh yeah, Southern Cal isn't always perfect. lol! That's so interesting about the jade plants. I really didn't know that. Good for your dad for planting so much that the firemen love him! Love your ornie finishes. Nice that your mom helped you out with one. I have no clue how to do piping myself. Great finishes! I like the look of the piping. I've never tried that before! The weather is pretty ify in CA isn't it. It's foggier and gloomier than usual here too! Lovely finishes...and the piping is a perfect touch! Would your mom show me how to finish like that?? Jade plant for firewalling the house...very smart papa you got there!! Isn't the weather just lovely today?! I don't mind rain, but I hate driving when raining - and that's exactly what I had to do this morning!!! I love Jade plants, it's so clever for your dad to plant them as fire barriers!! WOW!!! 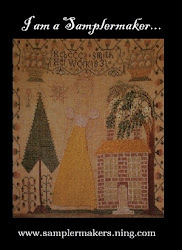 What wonderful finishing on your stitching. I love them both. 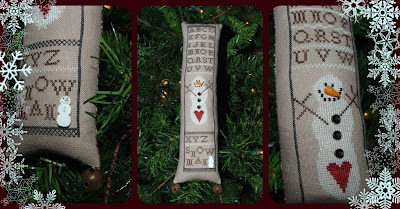 Every now and then it is nice to have a rainy day, especially if you can stay home and play with your stitching things!! The jade plants are pretty and I didn't know that they could be used as a fire break. Beautiful finishes Mindi, love the Fa La La! So do you hire your Mum out for lessons. i love your ornament so much..beautiful finishes.. Very nice finishes Mindi. Love the piping on FaLaLa! The view must be lovely from the patio and very smart of your dad to plant the jade. Both are cute cute finishes! 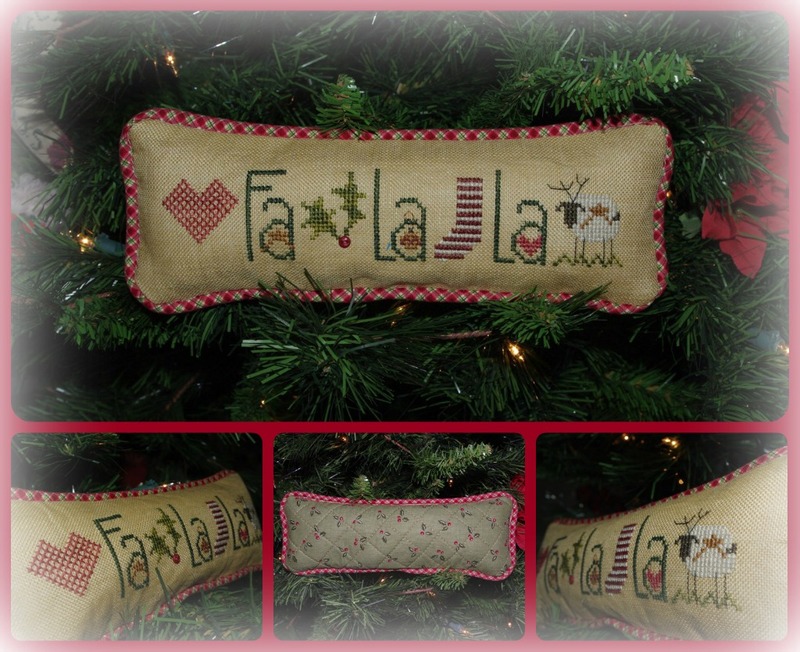 I love the piping on the Fa La La - fabulous!! Oh wow I am so in love with your SB finish! It is gorgeous! I have no idea how to do piping! Love your Primitive Snowman too! I feel rather enabled! I'll bet seeing all those jade plants out there in person is quite a sight, Mindi! Love your finishes and how nice to have your mom as assistant finisher :) They look just wonderful! Love the SB finish, the piping works so well with it! The EE&F one is so cute too!! Hope the blue skies have returned!